OLDRIGHTIE: The Silly Games These Kids Play. The Silly Games These Kids Play. They Do Love Their Pathetic Immaturity. More smoke, Chief, cries the rather weak Skipper from the bridge. We can happily waste energy on our political needs. Those, of course, include duping the oh so gullible populace with smoke screens. The fact that this ploy is so regularly used these days also points to the frailty of leadership and governance, from all quarters. The price of our electricity and gas, indeed our water as well, is bound up with The EU appetite for screwing us at every possible opportunity. The so call "climate change" mantra and renamed, or smoke screened, AGW, (global warming), con trick is a perfect example of the obfuscation, now employed, not only daily but by the bloody minute. Note how these kinds of facts are quickly mentioned then wrapped in a dark and enveloping cloud of "nothing to see here, move on". Or in the link given, a ridiculous interpretation is offered in the face of the obvious. Night suddenly becomes day, due to climate change. Please let them know their stupidity. Our erstwhile leaders, well EU lackies, really, rapidly become masters at these PR stunts and dark arts. 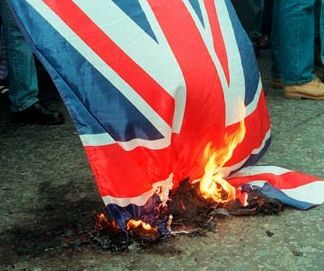 The pretence at repatriation of powers by the Home Office, the suggestion that the EU economic nightmare is now ended and the plethora of announcements and policies, all are but acrid and negative proposals for a less than happy future. Our energy policy is a joke that's not funny when we shiver in the dark whilst paying for energy soon to be denied us. We still have billions of barrels of oil and untold gas reserves beneath our feet, as dangerous to excavate as ever coal was and could still be. Whilst wringing their manicured, soft, idle hands, the cretins who rule over us panic over a future none of us will ever see. Our planet is boiling away at its core. Our sun will not burn forever and our only concern is how long we can sustain human life on this Globe. Such matters are so far into the future as to make today and today's activity wholly irrelevant to the distant horizon. We should not pollute nor should we be greedy but we do and we are. So lets frack ourselves into prosperity. Invest those savings to make us free of worry and free of EU bureaucratic crap. Lets mine and as cleanly as we can, burn coal. Pump more oil from our sea beds. Imagine the jobs created and easily funded! What's not to like but EU jealousy? Why not be rid of that costly, wasteful, corrupt, and stupid EU Federal rubbish. Remember that this word "Technocrat" is yet another smokescreen to disguise that hated figure, the bureaucrat, when they offer us a Technocrat, London based, mentor from hell. Finally, I urge everyone, thick or bright, thin or fat, young or old, to bear in mind that we as a Nation and group of Islands are rich in energy. We do not need to take any lessons from The EU about keeping warm. Trouble with that, of course, is The EU has promised Russia to buy and import so much of their gas, in return for technocratic bungs. Competition isn't very welcome. More smoke, more smoke, more smoke. Cough, cough, cough! Tenbury Wells Cinema, Tues 23 October 7.15. Royal Ballet "Swan Lake" live from Covent Garden. Give the lady a treat! Wow, Demetrius, will you be there! We were on Saturday, the team were on top form. So how far did you have to travel, you tease! From just along the line from where Charles Dickens was a passenger in a train that literally went off the rails. Or rather where workmen had just removed some rails. There is a moral there. That's a goodish distance from Tenbury, is it not!? Ah, we were at Covent Garden. As for Tenbury Wells we once lived in Worcester. However, in the male line I go back to Worcs & Hereford to the 16th Century at least. Then we must have a pint when next you visit.